You just got your pool opening and you are starting to balance your chemicals like a responsible pool owner. Don't be fooled, there are people who think that once your pump starts up you are done for the year. You know better though, weekly swimming pool maintenance and simple pool chemistry 101 will keep your pool in tip top shape for the year. How to Make Swimming Pool Services even Easier for the Year? By using enzyme based products with your weekly swimming pool maintenance will help to make cleaning and balancing chemicals in your pool even easier. If you have a salt water pool, one product that works great is Natural Chemistry's Salt Water Magic. 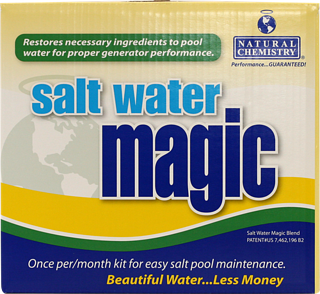 Salt Water Magic is a monthly application that you put in the pool and contains 2 products. Scale preventor that helps reduce scale and calcium buildup on the salt chlorine generator. This product, when used consistently will help extend the life of your salt cell. Salt Water Magic Enzyme product with phosphate removal that will help remove non-living organics in the pool. Reduces phosphates in the pool which further helps reduce calcium buildup on the salt cell. With the reduction in non-living organics in your pool, you will be able skip brushing of your pool walls along with filter media cleanings. In our hurry up society and our every busy schedules, simple to use products like Salt Water Magic allow you to have time every week. Less time that you need to do swimming pool services means the more time you have to actually swim in your pool, go golfing, work out, go shopping, take a nap or anything else that you want to. If you use your swimming pool maintenance as time to yourself without the kids yelling or your spouse telling you to do something else, this is perfect as you can look like you are laboring over the pool when you aren't. Enjoy another cup of coffee or just walk around the pool, the Salt Water Magic is going to make it easier than you are making it look. If you want more information on how enzymes work and what they do for your swimming pool maintenance, you can look at our post regarding Pool Perfect Total.